Bed with black or mahogany wooden frame, chromium-plated legs. Springing by hide leather belts. 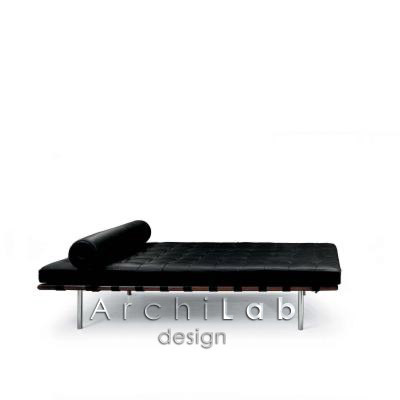 Polyurethan foam upholstery, leather covering. 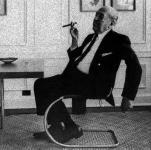 Designed in 1930 by Ludwig Mies van der Rohe. The strap and cushion details are similar to the "Barcelona" chair. The cushion detailing was e contribution of Lilly Reich, a close collaborator of Mies. It was first used in 1930 in the New York apartment of Philip Johnson. However its first public appearence was at the Berlin Building Exposition.